I am not normally a friend of the Myth-Busters show, but the other day they tested methods of keeping bears out of garbage cans. Most things did not work, as we all know very well. One thing though promised success: Cayenne Pepper or Chili Powder. I decided to try that out this spring. I got myself some Cayenne Pepper and starting spreading the powder over the garbage can every time I took some out. This worked quite well for the first few weeks – until it started raining. Of course the rain washed off the spice from the garbage can and so I lost the protection. 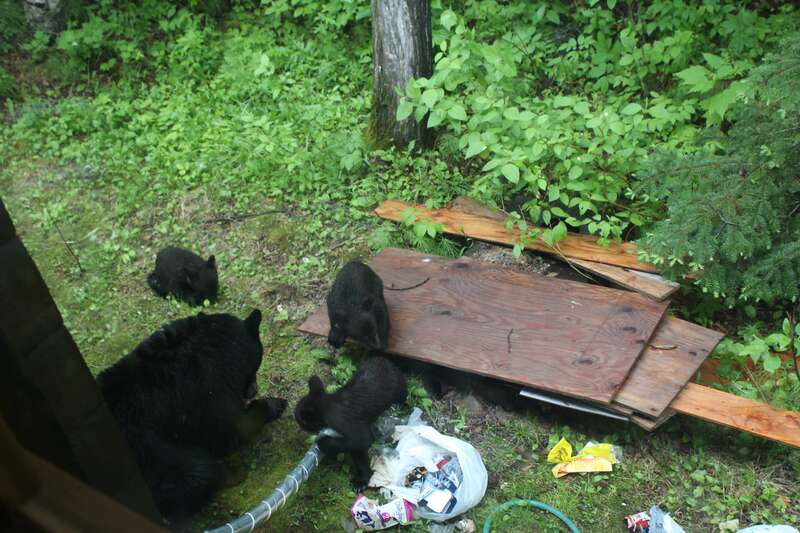 Mama bear and her three little cubs didn’t take long to take advantage of the new available food source. The cubs were very cute and very small, they almost looked like they could fit into the palm of my hand.